This entry was posted in Google Apps Developer Blog and tagged Apps Script, developers, G Suite, Google APIs, Google Apps, Google Apps Marketplace, Google Docs API, Google Drive SDK, Google Sheets API, Google Slides API on July 19, 2018 by Google Apps Developer Blog Editor. We recently made App Maker generally available. 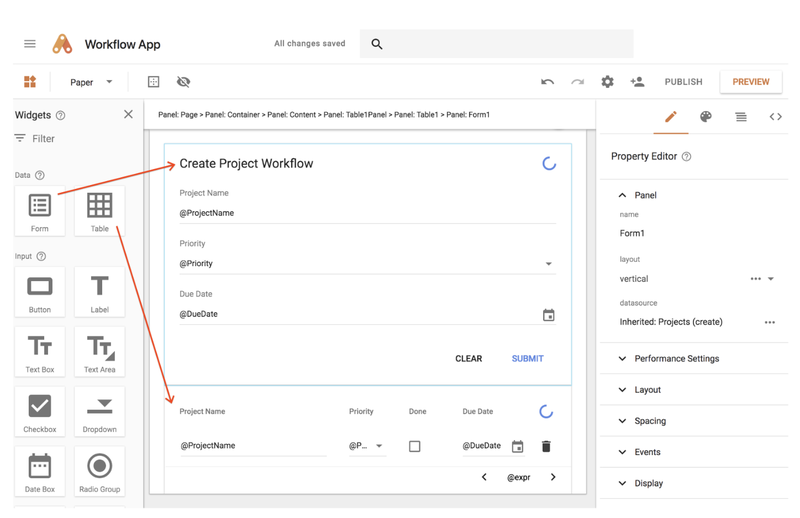 App Maker is a new, low-code development environment for G Suite that lets you build a wide range of apps for your business and customize processes to help you be more efficient. Building apps in App Maker is easy. You can declaratively define your app’s backend data, visually design a UI, add custom behaviors with Code (optional) and publish your app quickly. To get familiar, here’s a quick walkthrough of App Maker’s main app development features. 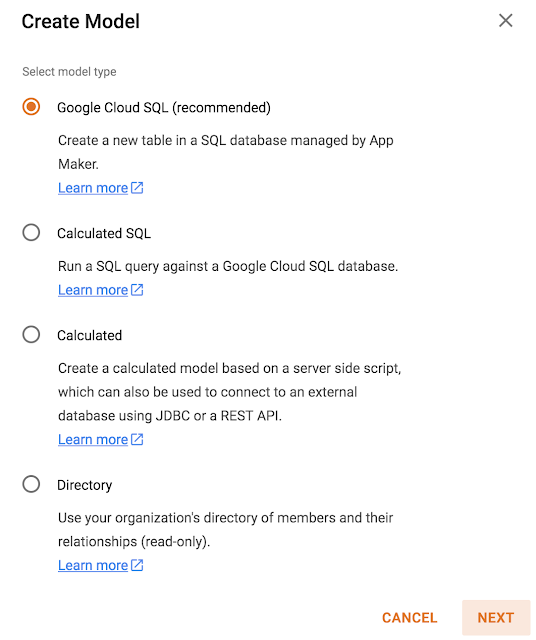 Cloud SQL - connects to Google Cloud SQL (GCP account required). Calculated - a computed virtual model via Scripting or SQL. 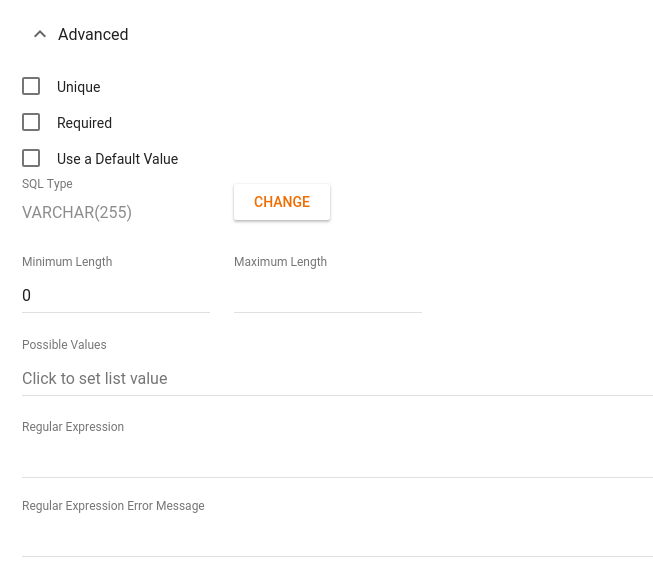 It can also connect to external data (JDBC, REST). Directory - fetches your organizational data. 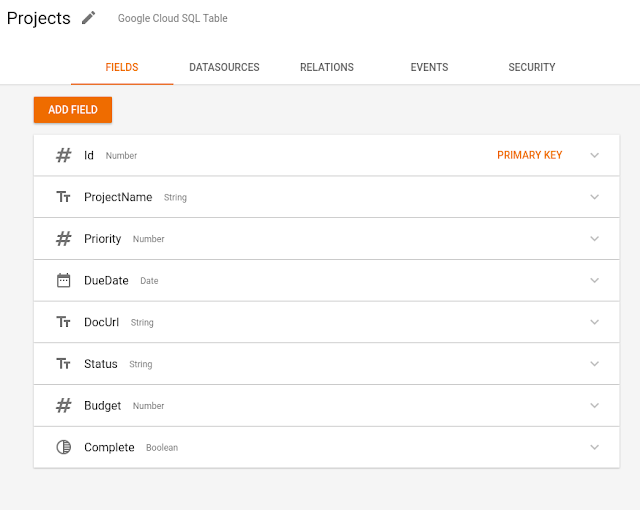 To build Data Model Fields you can either build them from scratch, or use an existing CSV or via a Google Sheet. 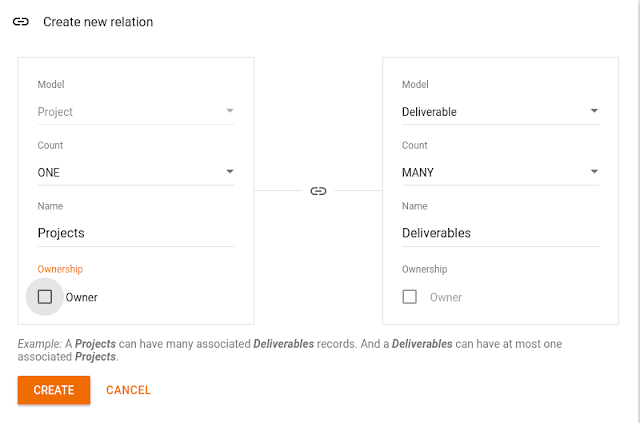 After defining the structure of your Data Model you can insert validation rules to limit what data can be saved. Building relations (one-to-many, many-to-many, etc.) between data models is easily doable in the App Maker Relation Editor. The App Maker Model editor also provides a variety of other features that include setting up custom queries and filters, securing data access based on Roles as well as triggering Data Events based execution. 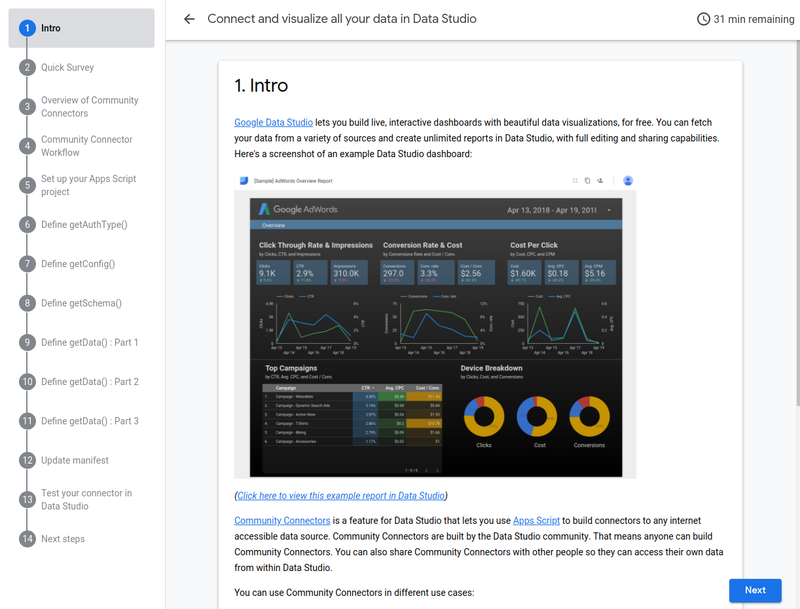 See the Data Models documentation for more info. App Maker helps you streamline UI development by providing a visual design environment where you can drag and drop UI elements (Widgets) onto a canvas and then set the properties of the widgets using a Property Editor. Or if you want, there are also helpful UI generation wizards that can create ready-made UI structures, including Edit or Insert Forms, Tables and a variety of Charts to further speed UI development. The look and feel of the UI is governed by CSS, where the default is Google's Material design standard. A variety of style variants are available in the editor so that the author can easily toggle how a widget is rendered via a dropdown menu or direct CSS editing. The UI is connected to backend data via App Maker’s data-binding feature which allows an author to connect widget properties to data model fields. The combination of visual design, databinding, CSS UI Styling with, Google Material as a default, all contribute to a productive UI creation experience. For full coverage of App Maker UI concepts. see the UI documentation. 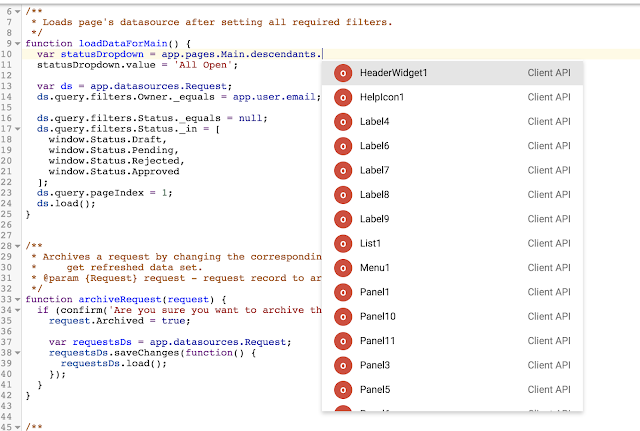 Although App Maker does all the heavy lifting when it comes to database communications and UI design, sometimes you need to customize application behaviors. This is where App Maker’s scripting feature comes in. App Maker streamlines the process of writing code by providing an intuitive Code Editor that’s equipped with helpful Code Completion. Plus, App Maker provides syntax error highlighting along with an interactive warning/error indication feature. For more information on App Maker coding topics, see these Scripting Docs. Finally, App Maker provides an easy-to-use Preview feature where you can quickly test your app on your own. When you’re ready to share your app with users, App Maker provides a comprehensive Publish (or Deployment) feature. To learn more about previewing and publishing apps, see the publishing guide. Now that you have a general idea of App Maker’s features, have a go at the App Maker Codelab. Note: You’ll need to have App Maker enabled on your domain via G Suite Business/Enterprise or G Suite for Education. To learn more about App Maker, visit developers.google.com/appmaker or stay tuned for more information! 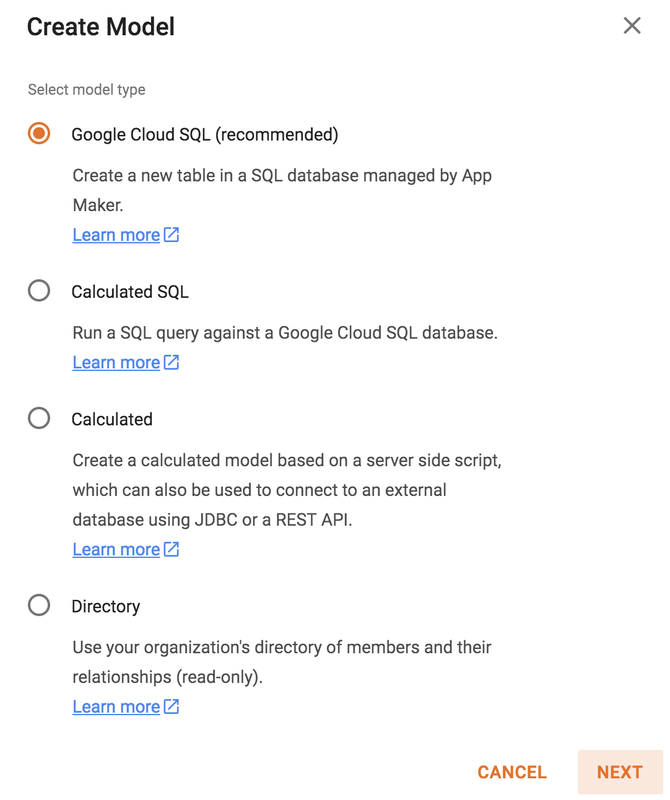 This entry was posted in Google Apps Developer Blog and tagged developers, Google Apps on June 18, 2018 by Google Apps Developer Blog Editor. Do you feel like you live in a chat window, and wish it could do more? Google made Hangouts Chat generally available earlier this year to help. This messaging platform helps users easily collaborate from one place, and features archive and search, tighter G Suite integrations and the ability to create separate, threaded chat rooms. More importantly for developers, Chat includes a bot framework and API. Whether you want to automate common tasks, query information or perform other heavy-lifting, bots can help transform the way you work. 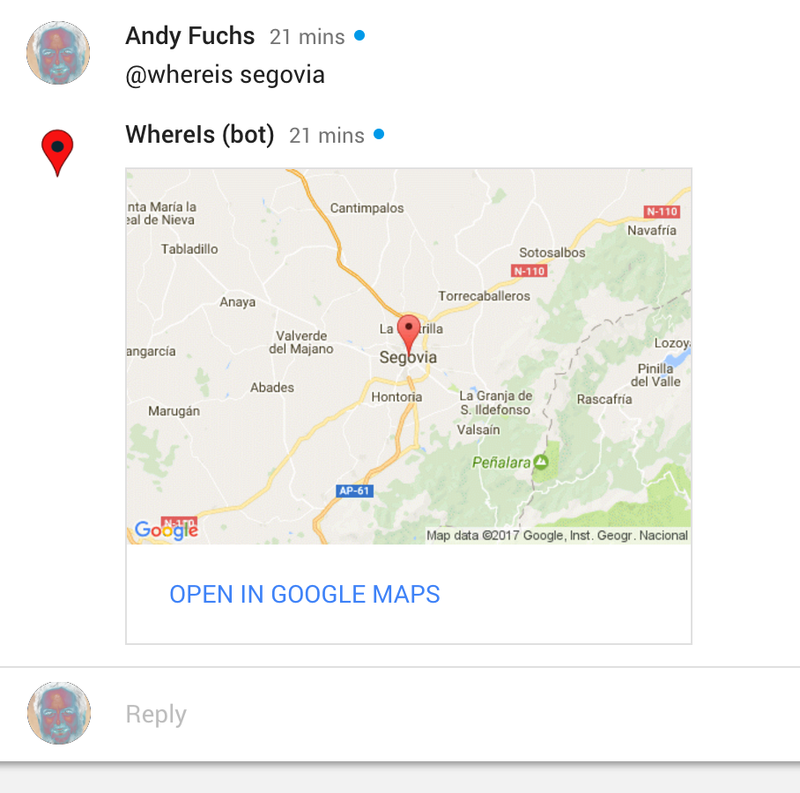 In addition to plain text replies, Hangouts Chat can also display bot responses with richer user interfaces (UIs) called cards which can render header information, structured data, images, links, buttons and more. Users can also interact with these components, like updating displayed information. In the latest episode of the G Suite Dev Show, we talk about how to create a bot that features an updating interactive card. REMOVED_FROM_SPACE - A bot will perform any desired "paperwork" when it is added to or removed from a room or direct message (DM), generically referred to as a "space.” When added to a space, a bot will generally send a welcome message like, "Thank you for adding me to this room." No notifications are sent when a bot is removed from a space (because the bot has been removed… duh!). Developers typically just log that the bot has been removed. MESSAGE - Receiving an ordinary message sent by users is the most likely scenario. Most bots do "their thing" here in serving the request. CARD_CLICKED - The last event type occurs when a user clicks on an interactive card. Similar to receiving a standard message, a bot performs its requisite work, including possibly updating the card itself. The bot pseudocode as well as the bot featured in the video respond synchronously. 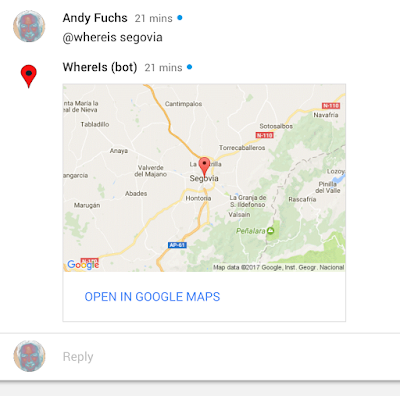 Bots performing more time-consuming operations, or those issuing out-of-band notifications, can send messages to spaces in an asynchronous way. This includes messages like notifications when a job is completed, alerts if a server goes down or pings to the Sales team when a new lead is added to the CRM (Customer Relationship Management) system. 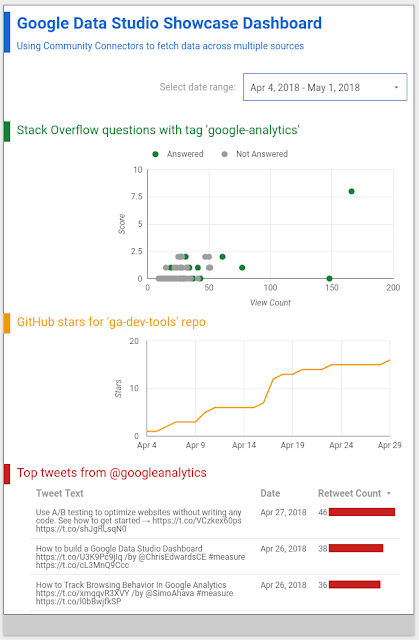 To get started, check out this post on the Google Developers blog or this post for a deeper dive into the Python App Engine version of the vote bot featured in the video. You can learn more about developing bots for Hangouts Chat by reviewing the concept guides as well as this “how-to” on creating bots. This entry was posted in Google Apps Developer Blog and tagged developers, Google Apps on June 13, 2018 by Google Apps Developer Blog Editor. 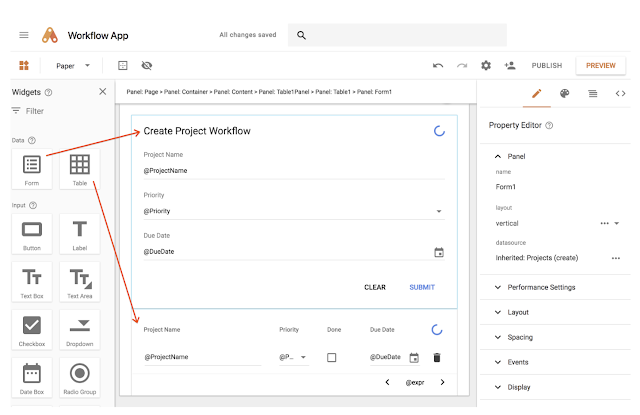 Last October, we launched the Gmail Add-ons framework so that developers can build apps that appear inside Gmail. As a part of the launch, we invited a few partners to try out the new platform, including Trello. Trello’s team built an add-on that allows its users to create Trello cards right from their inbox. On Trello, “cards” represent individual tasks that are part of a larger workflow. To learn more, we sat down with Desmond Morris, Trello’s lead developer for the add-on, to get his thoughts on the experience. What is the Trello Add-on for Gmail? Why did you decide to build it? The Gmail Add-on we built for Trello makes it easy for folks to take incoming email messages and immediately send them to a Trello board. Trello’s board and list format gives the user more context as to where a task is in the process. Basically, when you open up an email in Gmail, there is a Trello icon in the top right corner. When you first click the icon, the add-on will ask you to log in to your Trello account. Once authenticated, you are presented with the card creation form. The form is pre-populated with the subject and body of the email, and allows you to select both the board and list to which the card should be added. Trello already integrates with other G Suite applications—Trello users can attach Google Drive files and folders to Trello cards and send alerts to Hangouts Chat right from Trello. Given the already tight integrations between our two products, building the Gmail Add-on felt like a natural fit. What was your experience like building the Gmail Add-on? Before I started building, I took a look through the docs and the samples that Google provided. There was a sample add-on which incorporated nearly all of the features provided by the framework. It was great because it basically gave us a set scope for exactly what we wanted to do. So my immediate first step was to dig around and start matching up the ideas I had in mind for the add-on and how the example demonstrated those features. At first when I was developing the add-on, I didn’t even touch mobile. When I finally got to the mobile portion, I was surprised to see that the code I’d been working with for the web client also worked on mobile, with no extra code on my part. It was easy, really. I was initially surprised that the Add-ons framework didn't allow for "free rein" control—the ability to add a myriad of HTML/CSS/JS. But then I started using the tools and found that I had enough flexibility to be effective. Limiting what you can do actually helps make these add-ons device agnostic, which in turn relieves much of the burden from the developer. Do you have any tips for developers who are considering building on the platform? The tip I would suggest to developers, especially if they are new to the platform, is to make good use of the guides and sample code provided. It was helpful in allowing me to understand what was and was not possible within the platform. It's great that we were able to add further integrations with G Suite for our users using add-ons. To get started, visit the Gmail Add-ons documentation or check out this video library for inspiration to learn how to use Apps Script to build add-ons. 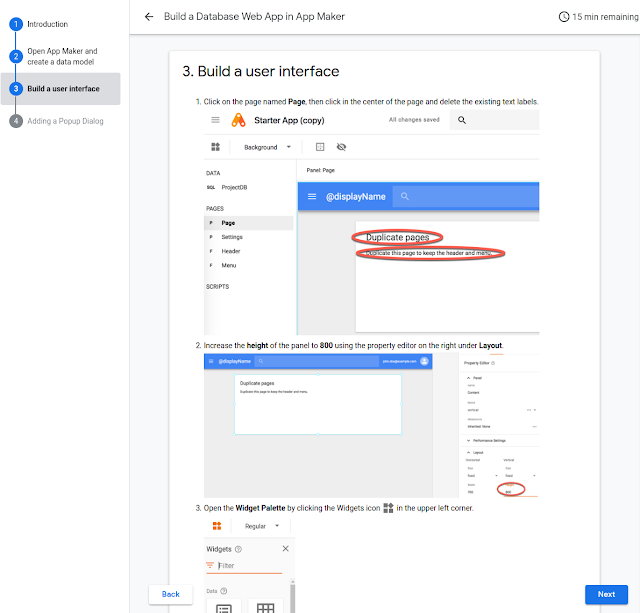 This entry was posted in Google Apps Developer Blog and tagged developers, Google Apps on June 5, 2018 by Google Apps Developer Blog Editor. This entry was posted in Google Apps Developer Blog and tagged developers, Google Apps on June 4, 2018 by Google Apps Developer Blog Editor. This entry was posted in Google Apps Developer Blog and tagged developers, Google Apps on May 31, 2018 by Google Apps Developer Blog Editor. When it comes to Slides, if your users are delivering a presentation or watching one, sometimes it's good to know how far along you are in the deck. Wouldn't it be great if Slides featured progress bars? Using Google Apps Script, we craft this add-on which lets users turn on or hide progress bars in their presentations. The progress bars are represented as appropriately-sized rectangles at the bottom of slide pages. Here's a snippet of code for createBars(), which adds the rectangle for each slide. This entry was posted in Google Apps Developer Blog and tagged Apps Script, developers, G Suite, Google APIs, Google Apps, Google Slides API, GSuite on March 5, 2018 by Google Apps Developer Blog Editor. This entry was posted in Google Apps Developer Blog and tagged Apps Script, developers, G Suite, Google APIs, Google Apps, Hangouts Chat API on February 28, 2018 by Google Apps Developer Blog Editor. This entry was posted in Google Apps Developer Blog and tagged developers, Google Apps on February 13, 2018 by Google Apps Developer Blog Editor.